Carving clean GS turns has been the ultimate goal of both racers and coaches for at least two decades. 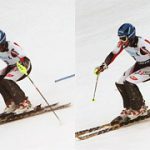 It is a common knowledge that in order to carve, a racer needs to roll the ski on edge by executing a succession of technical elements generally described as edging. 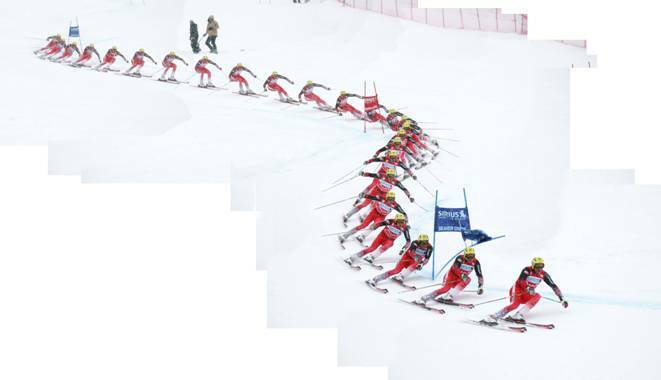 The racers of the past, while using straighter and longer skis, predominantly used knee and hip angulation in order to produce edging in the turn. Modern technique executed on the shorter skis with a larger side-cut dictates the different mechanics of edging – inclination. 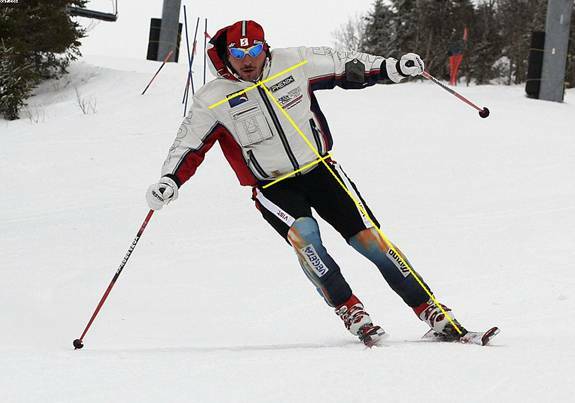 — the outside leg is extended and the shoulders and hips are level with each other and square to the skis (notice the parallel superimposed lines in the photo 1). As seen from the photo 1, the skier’s body is in perfect skeletal alignment with minimal stress on the joints. 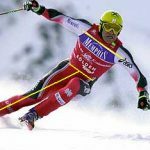 The properly performed inclination is different from «leaning in», often defined as applying too much weight onto the inside ski too early in the turn, and considered by coaches and racers to be a gross technical error. While inclining, author (in photo 2) keeps his hips and shoulders moving together. Once the shoulders start to tip and get ahead of the hips, the racer ends up leaning in and skidding the turn. However, having the shoulders get behind the hips or deliberately trying to keep shoulders level with the slope in the first part of the turn results in the excessive angulation often referred to as a “locked position”. 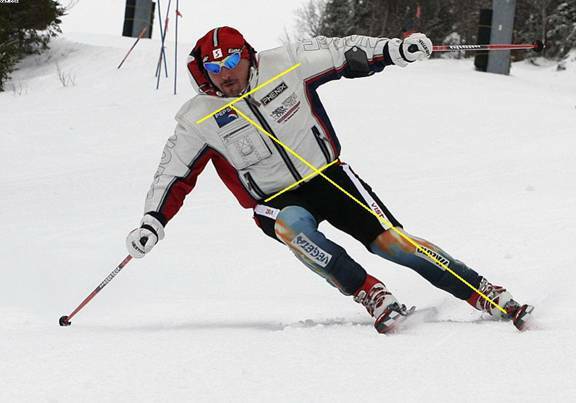 In modern GS technique the ski edge angle is created primarily by extended outside leg with minimal or no knee angulation as shown in photo 3, depicting Kalle Pallander of Finland and Frederik Niberg of Sweden. Both pictures are taken at World Cup GS in Beaver Creek, Colorado in December of 2005. Inclination, performed with the right timing and precision, is an art that takes years to master. In order to understand why it has become one of the fundamentals of modern technique we can look at the basic principle of carving the turns through the gates. A racer who can carve turns most cleanly while holding the tightest line throughout the course will have highest overall speed. The physics of the process are also simple – a racer carving turns on the tightest possible line delivers his center of mass from start to finish through straightest, most direct path. 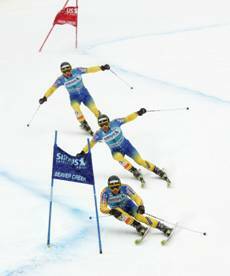 It is clearly demonstrated by arguably the most efficient ski racer of modern era, Hermann Maier of Austria, shown here negotiating a World Cup giant slalom course in Beaver Creek, Colorado in 2005 (photo 4). An extended outside leg is essential for proper inclination and displacement as demonstrated by Maier (photo 3). Extension of the “new” outside leg, which was bent at the completion of the previous turn is a key to an effective inclination. While legs are extended, neither hip nor knee-joints are “locked” as demonstrated by racers in photos 1-3. Projection is the movement of the center of mass (CM) in the direction of the future turn. This movement is clearly demonstrated by Maier (photo 3) in the transition between the red and the blue gate. Racer’s upper body and hips are projecting forward, over the skis while skis are moving under the body. 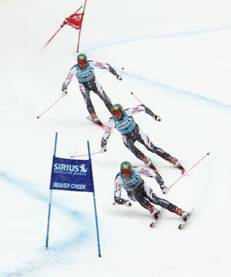 It could also be described as a cross-over movement, with the racer’s CM crossing over the skis, while skis are crossing under the body — a cross-under. In properly executed modern technique extension and projection are inseparable. They provide for the movement of the racer’s CM forward and inward during the initiation phase of a turn. The combination of extension and projection allows Maier to enter a new turn in a proper inclined position with hips and shoulders level with each other, and an extended outside leg (see three frames above the last blue gate). Properly executed extension/projection provides for efficient re-centering. Re-balancing or re-centering is needed in order to provide the pressure on the shovel of the “new” outside ski by the initial stage of the inclination. Re-centering is necessary regardless of the type of movement used in the transition. 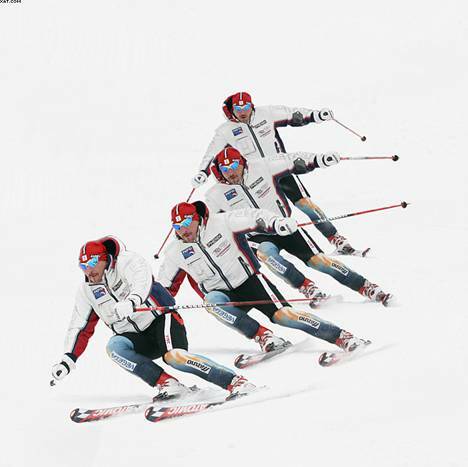 While in photo 3 Maier uses pure down-unweighting (retraction of the legs) in the transition between the first blue gate and the red one and between the red gate and the next blue one he uses slightly more upright movement, in both turns racer starts the inclination with sufficient tip pressure on the outside ski (see three frames above the red gate and three frames above the last blue gate). Perhaps the demonstration performed by the author gives a better perspective on re-centering since the shots are taken from the side (photo 4). In the second frame author is balanced over the tails of the skis while edges are released from the previous turn. At this point the tips of both skis are in the air, but within a fraction of a second the skier is re-centered (frame three). Outside leg is extended and the tip of the outside ski is engaged. The pressure on the shovel of the skis is evident from the last frame clearly showing some bending of the skis. Angulation or “break at the hip” in the final phase of the turn is demonstrated here by Pallander and Nyberg (photo 3). Often considered an edging movement, angulation, in reality, just compliments inclination. It serves to maintain an edge grip when forces build up in the second part of a turn. Angulation cannot be performed effectively unless the initial edge angle is created by proper inclination. For a powerful turn exit, it is important that the outside leg stays extended until after the arc is completed. The tendency of the modern technique of using the reduced angulation and more pronounced inclination is clearly demonstrated by Maier (photo 3, frames at the last blue gate). It is worth mentioning that the angulation in modern technique is created by slight straightening movement of the torso resulting in bringing the racer’s shoulders in horizontally level position. More often than not, gross angulating movement in the hip joint is no longer needed. The amount of angulation is determined by the speed and the radius of the turn.